ALL Items Sent From Our UK Warehouse. Same Day Despatch Before 4pm! 10 Metre 33ft Portable Folding Aluminium Telescopic Radio Antenna Mast Kit 6 Way. A fantastic quality and great priced mast. This fully telescopic mast can be extended anywhere from 2.2 metres all the way up to a whopping 10.06 metres, as each section has an indpendent thumb screw locking mechanism that will prevent the mast from slipping. 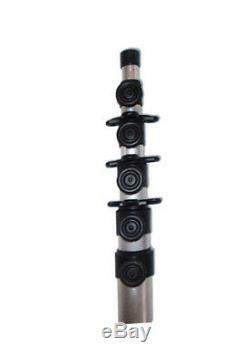 Offering the added benefit of integrated circular guy rings on each section (each guy ring offers 3 guy line mounting points), this mast has a variety of uses - but is perfect for fixed or portable installations of light to medium weight two-way radio antennas, such as amateur radio, PMR & CB/10m antennas. Full'no rust' aluminium construction the mast is fully weatherproof and has section end bungs allready fitted, so will never let the rain in, or'lock up', and can be left outside all year around. Locking Mechanism On Each Section: Yes. Diameter: 5.08cm / 2" (Bottom) - 2.54cm / 1" (Top). Extended Length: 10.06 Metres (33'). Collapsed Length: 2.20 Metres (7.2'). Section Length: 2.03 Metres (80). Maximum Head Load: 5kg Variable (Dependent on wind speed and mast length). For Cheques then the clearance time may be up to 10 days after we receive the Cheque. International orders may take longer. Items sent to remote UK destinations courier to the following postcodes may incur a surcharge: AB36-38, AB55-56, FK17-21, IV1-39, IV52-54, IV63, KW1-14, PA21-40, PH19-26, PH30-41, PH49-50, HS1-9, IV40-51, IV55-56, KA27-28, KW15-17, PA20, PA41-49, PA60-78, PH42-44, ZE1-3, AB36-38, AB55-56, FK17-21, IV1-39, IV52-54, IV63, KW1-14, PA21-40, PH19-26, PH30-41, PH49-50, Isle of Wight, Isle of Man, Scilly Isles, Channel Islands. Some remote international destinations may also incur a surcharge. Any product you return must be in the same condition you received it and in the original packaging. The item "10 Metre 33ft Portable Folding Aluminium Telescopic Radio Antenna Mast Kit 6 Way" is in sale since Thursday, November 1, 2018. This item is in the category "Mobile Phones & Communication\Radio Communication Equipment\Antennas\Ham/Amateur Radio Antennas". The seller is "tech-megastore" and is located in GB. This item can be shipped worldwide.